You will need a visa to travel to Nepal. Visas are available on arrival at Tribhuvan International Airport (Kathmandu) and at some land borders. You can pay in pounds sterling at the airport (currently £20 – £75 depending on the duration of your stay). Bring two passport-sized photos with you. If you wish to stay for more than 60 days you can extend your visa up to 30 days by applying to the Nepalese Department of Immigration at Kalikasthan, Kathmandu (telephone: +977 1 4429659). You must have a valid visa in your passport to leave Nepal. If your visa has expired you will have to arrange an extension at the Department of Immigration before your departure. Overstaying without authority is a serious offence and you can be detained or refused permission to leave until a fine is paid. All said and done, they make it pretty easy for foreigners in Nepal. Tourism is the nation’s number one industry. Do I need a permit to ride in the Himalayas? Yes you do, but these are all included in your package price. This includes the ACAP permit (Annapurna Conservation Area Project) and TIMS (Trekkers/Bikers Information Management System). Are there any injections I need to have before entering the country? What's the political situation in Nepal. Are tourists at risk? As with any country there’s always a potential risk when traveling. Due to the changeable nature of political risks, it is impossible to say in advance what these may be or how they could affect you. The UK foreign office keeps up to date travel advice https://www.gov.uk/foreign-travel-advice/nepal and our team has many years experience in travel to far flung parts of the world. The main thing to remember is that Nepal has a long history of foreign tourism and somewhere in the region of 40,000 UK nationals travel there safely every year. If you have any questions or worries at all, please contact us. What sort of spending money will I need? Other than flights, there won’t be much in the way of other costs. Most food is included. Days where it is not, you’re looking at $3-10 for a meal. Any extra nights accommodation can be found in the region of $10 a night. The transfer at the end of the trip (Pokhara to Kathmandu) is about $10. Drink are extra, but again we’re not talk much here either (although Alcohol can be more expensive). We suggest that $200 spending money would be enough for the two weeks. Although have the means to take out extra if needed. My Travel Cash card is a good way of carrying extra funds. How can I find the best flights to Kathmandu? We recommend using skyscanner for finding the best flights. What's the weather likely to be like? In mid-hills (Kathmandu, Pokhara and hills) – 15 to 25 degrees Celsius. In the mountains above 2500m – 12 to 18 degrees Celsius during the day and 0 to 8 degrees Celsius at night. Although at this time of the year we can expect lots of fine weather, there is always the chance of rain or snow in the higher regions. Always be prepared! What sort of riding gear will I need? Please see our indepth kit list for further information. Please see our accommodation page for further details on the accommodation we use. Are there different options for accommodation? Yes there are, you can “upgrade” your accommodation during your trip (subject to availability and depending on the area we are staying in). Will these affect the price? Yes, although it’s not likely to be by much. How will my luggage be transported? Under normal circumstances your luggage will be transported with you either by private minibus, Jeep, flight or porters. Where will my bike be stored at night? Your bike can live with you in the guest house. Our accommodation has private outside spaces and secure storage for your bike. In most cases it is also possible to bring your bike into your room. What sort of food is included/available? All meals are included (breakfast, lunch and dinner). Drinks are not included, except for tea and coffee with breakfast. Meals vary depending on our location in the country, but local cuisine is available as well as more traditional western food. Can you cater for vegetarians? Please see our riding page for further information. If you’re still not sure if it’s the right holiday for you, then please feel free to contact us. The short answer is yes, as we will be riding on challenging terrain at high altitude. However, we can tailor trips to the needs of a group in certain areas. A good base level of fitness should be sufficient (normally achieved by riding 6-8 medium length rides a month). Please contact us if you’re unsure. Remember, you can always do a training plan before the holiday. What happens if I find the descents too difficult? In most cases, alternative descents are available (such as 4×4 tracks or roads). As we have at least 3 guides out on a ride, there are always options to split the group slightly. Do I need knee/elbow pads? We would recommend lightweight knee and elbow pads. Heavier duty padding might offer more protection, but you’re likely to find it too heavy to carry on the longer climbs. Will I be able to get bike spares? Spares (and a workshop) will be on hand in Pokhara. However, once we head up in to the Annapurna range, spares will be difficult to come by. We therefore have a list of recommended spares in our kit list. What if I don’t fancy riding every day? You don’t have to ride every day if you don’t want to. Obviously this is an easy option when we are in and around Pokhara. However, once we’re in the Annapurna range and you don’t want to ride, you’ll need to get a bus to the next town. Remember that you can descend on 4×4 tracks if you want an easier day. In 2015, both Mark and Pete will be guiding you for the duration of the trip. They will be supported by local Nepalese mountain bike guides who know the mountains, language and culture like the backs of their hands. If you want more information on Mark and Pete and their experience/qualifications, please visit our about us page. Can I see an example kit list? Yes, you’ll find our example kit list here. What do I need to carry whilst riding? Again, this is covered in our kit list. What's a suitable bike to bring? It goes without saying that you should make sure your bike is well serviced before arriving in Nepal. A hard tail is perfectly adequate to ride on. It can make the climbing and hike-a-bike sections easier too. A full suspension bike will obviously be more comfortable/forgiving on the descents, but can be heavier and more awkward to carry. In general, a bike that can cope with technical terrain and be comfortable for long days in the saddle will be more than adequate. We don’t organise this for you, but we can help you locate a hire bike once you’ve arrived in Pokhara. However, from experience we feel it’s best to bring your own. If you’re unsure if your bike will be suitable for the trip, then please contact us. Will my mobile phone work in the mountains? You should be able to find good mobile coverage when in and around Pokhara. Once we are in the mountains, signals might be weaker and non existent in places. So they shouldn’t be relied on 100% of the time. We use satellite communication devices to ensure that we have regular service – particularly important in an emergency situation. As with the mobile phone signal, Wifi be more readily available in and around Pokhara. In the mountains it’s likely to be a bit more temperamental. A smart phone with Wifi and roaming ability is probably the best device to take. It’s light and does the job, but not the end of the world if it doesn’t get used! What other facilities can I expect? In some places “facilities” are going to be limited and might be basic. We talk more about the accommodation here, but if you’ve still got a specific questions then please contact us. What are the health facilities like? There are well equipped hospitals in both Kathmandu and Pokhara. Many villages have health posts or clinics and there are primary healthcare stations in the trekking regions of the mountains. Both Joyriders guides hold mountain first aid qualifications and will be carrying an extensive medical kit. Your kit list also includes a basic first aid kit – although you might want to add sterile needles to your own kit too. What if I get altitude sickness? It’s very important we acclimatise correctly. As a result, when we ascend to higher altitudes, our itinerary is dictated primarily by a rigid acclimatisation process. We make every effort and use our experience to ensure you do not suffer from the effects of altitude sickness. In the event that you do suffer, we also carry medication to treat the effects while we relocate to lower altitudes. As we’ve mentioned elsewhere most of our riding is accessible by jeep track. If I injure myself, will there be adequate logistics in place to get me to a medical centre? Yes, depending on your condition we can always get you to a hospital either by jeep or helicopter. It’s very important that your insurance covers you for high altitude mountain biking (in remote areas) with air evacuation cover. We will be riding above 4,000 metres. Some insurance companies will differentiate between mountain biking and downhill mountain biking. You can be doing downhill mountain biking on a normal trail bike, without wearing a stormtrooper costume. Downhill mountain biking for insurance purposes can include any riding on a specific DH trail and/or getting mechanical uplift to a trailhead (in a vehicle or chairlift). We recommend you clarify this with your insurance company before purchasing. 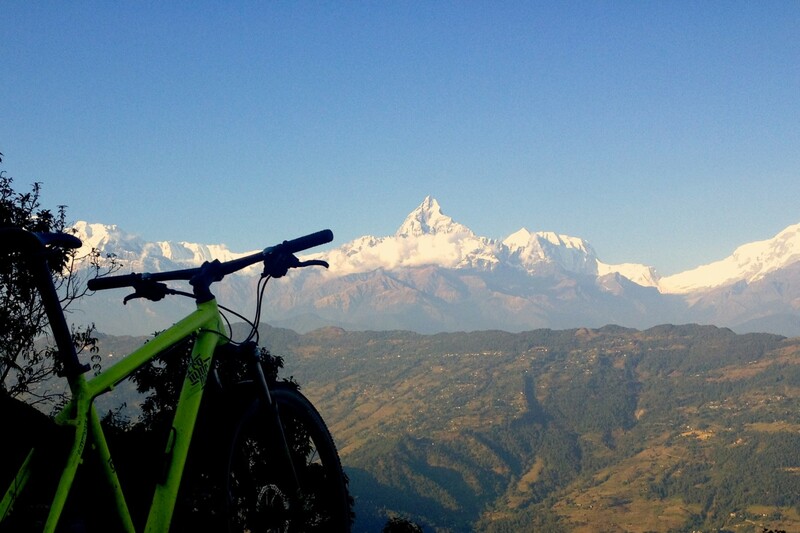 We will be using mechanical uplift and there is the option to ride a national DH course near Pokhara. It’s also important that you are covered for medical evacuation without getting permission from your insurance company first. There’s no point having insurance if you have to phone the company after an accident before calling for help. Again worth checking, as some insurance companies have this as a clause. We recommend taking a look at Sports Cover Direct Insurance.